The one to choose if your place can’t accommodate a standard size dryer, as it saves space and does a good job drying small loads. So far this machine is awesome! I was really hesitant about ordering this dryer because of some of the negative reviews. I got this thing home, plugged it in and went to testing it right away. I put a full load from my 2.1 cubic foot RCA portable washer and was blown away by how well this thing dried. The load included jeans and towels and the thing still dried everything in about 45 minutes. The air did get decently hot, not just warm. Maybe there are some defective units out there or something. I’ll update later, sooner if I run into any issues. So far this machine is awesome! I purchased this to be installed in my 5th wheel travel trailer. I have 30 amp service in my trailer and I was a bit skeptical about how this unit would work out. The other consideration with purchasing this unit was the fact that it would need to be vented outside in an RV application. I suppose that one could run the dryer inside without venting but this seemed a bad idea especially on a hot summers day, not to mention all the added humidity that reeks havoc on your RV’s interior. Venting inside your home is a different story.I found an installation location on the wall of my 5th wheel near a power source. The instructions were easy to understand. Additional thought regarding mounting in an RV situation is required. Every RV installation is different but I would definitely recommend a thought process for extra support above and beyond what the instructions suggest for home use. Traveling down the highway creates bumps and vibrations that typically don’t happen with home use. I built a small shelving unit beneath the dryer for added support and storage of laundry supplies as well as additional wall attachment support to accomplish this.Drilling a 4″ vent hole for venting in the side of my 5th wheel seemed daunting but it turns out that it was not a huge deal at all. I measured and then triple checked the measurements again before drilling. Home depot had all the necessary adapters and outside venting components needed to complete the job.The dryer runs on basically 2 heat settings. The lower heat setting takes longer to dry but the up side is that I can run my A/C unit while using the dryer. The higher heat setting works very well and on most days with an outside temp of 80 degree or less I can run the dryer and A/C together but I have to put my A/C on low speed or shut it off all together. Not a big deal for me.We have taken 6 trips since installing this dryer and I am very pleased with quality of the unit. It is so nice not to have to use public washers and dryers when traveling. 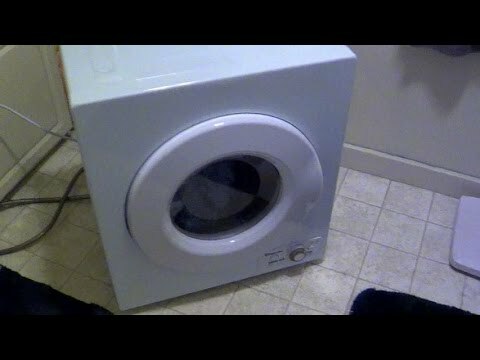 I paired this dryer with a small fully automatic washer from The Laundry Alternative. What a great portable dryer! I have a magic chef set! Soo in love with it! They pack it very well! I have a avanti bracket shelf and this dryer fits perfectly on it! Now I have my mini laundry!! THANK YOU AMAZON FOR PROVIDING THE BEST THINGS FOR HUMANS AND ANIMALS! We love this product. However, we have not even had he dryer for a month yet & it is making an awful noise coming from the motor each time the barrel rolls. We want to return/exchange it. This little dryer is just right for what I needed. I struggled with it setting it up (on a rolling stand, in my case) because of my age and lack of physical strength. I am able to lift it, but not carry it very far. I bought an indoor venting kit for it, which was easy to attach.When I first got it, it would NOT turn off. I set it up, installed the indoor venting kit and then when I plugged it in, it came on. So I turned the dial to OFF. It kept going. So I turned it a little this way and then that, but it kept going. So I turned it to the other OFF position, but the same thing happened.I called Amazon, who offered me a refund or replacement. This is a large item which would not be fun at all to rebox, or spend 20 minutes trying to drag to the door for pickup.I was going to call Magic Chef’s Customer Care (888/775-0202) for help. I went to their website and decided to contact them by chat instead. The woman who answered my chat said to call Amazon after I told her what the unit is doing. I told her I did not want to return the unit, I wanted to fix it and keep it. I said So Magic Chef does not stand behind their products?? She said to call Amazon, as they are a third party seller and it is not their problem. I could NOT believe what I was reading. I decided to register the product on Magic Chef’s website and email them to see if I could get more help. I did. They called and left a ticket number for me to call and schedule a service person to come fix the dryer. When I called, the lady on the phone told me one thing to try first which ended up fixing the dryer. Here’s what it was, for anyone else who experiences the same thing: This dryer has an Eco Mode. When my Eco Mode button was not pressed down (turning the Eco Mode on), my dryer would not turn off, but when I pressed the button in, and then turned the dial to Off, it turned Off.I love everything about this little dryer so far, but haven’t used it yet (waiting for my compact washer to arrive). 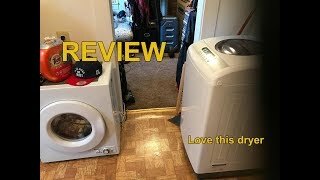 I will come back and update this review when I have used it, if I have anything to sayUPDATE: I have several things to add about this little compact dryer.I love the overall aesthetic of it. It looks nice and does not take up an inordinate amount of room. I wanted to set it on a solid table so I could more easily reach the lint filter after each dry load, but it made a noise that sounded like a ball point pen being scraped across a metal washboard. So I put it on the floor. It still makes the noise. All the time. Every load. This is my biggest issue. I went back to Magic Chef’s website, where I had registered it, and logged in thinking I would turn in a trouble ticket, but it did not even show I had registered it. What a waste of time. I tried to call customer service and was on hold forever. I gave up. I shut the door so I don’t hear the noise as loudly while I am drying, but I am very dissatisfied with the lack of customer service and with not being able to get any help for this problem. Going forward with this in mind, I will NOT buy another Magic Chef product. The dryer does okay drying about 1/2 a compact washer load of clothes at a time. Drying that much takes an hour or more most of the time. I rarely use the high setting because I don’t want to ruin my knit clothes.The lint filter is in the least convenient place they could possibly have put it, made far worse by the fact I have the dryer on the floor. It is in the center of the back of the drum, so I have to get all the way down on the floor to clean it after each load. 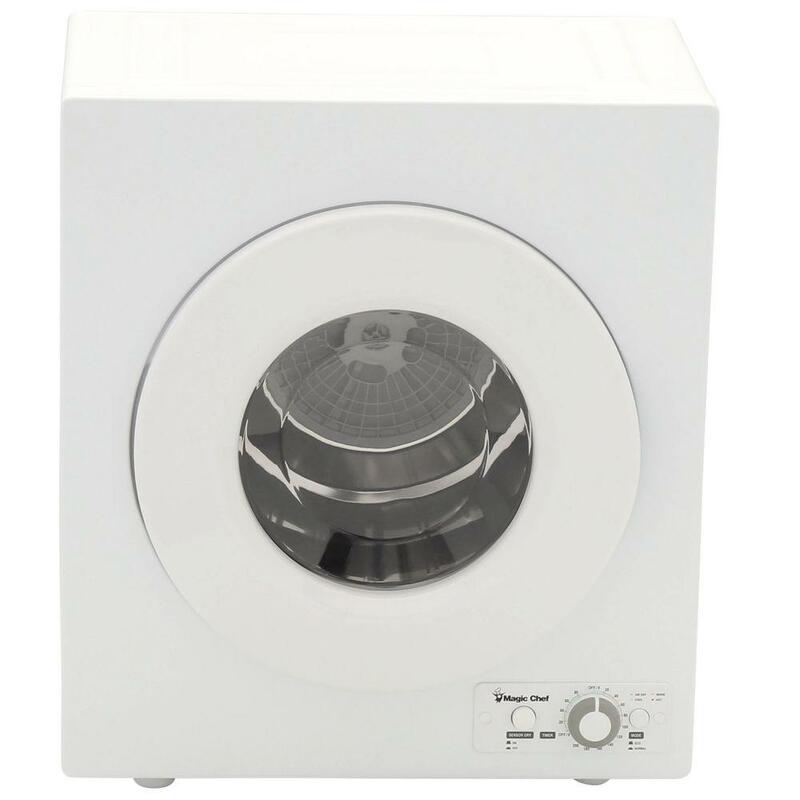 It is easy to pull off since it has finger holes, but difficult to put back in since you can’t see in the drum well to center it exactly.At this point, with the lack of help and repair available through Customer Service, I cannot recommend this dryer. 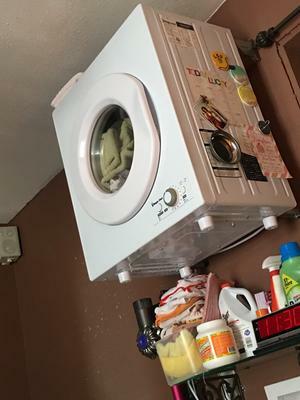 I give it three stars for aesthetics and compactness and it does actually dry clothes in small loads.UPDATE 10 MONTHS IN: Well, now the exhaust lint shroud (main lint screen in back of drum) has broken, so the dryer isn’t usable at all. This dryer is a waste of money and I will never buy anything made by Magic Chef again after the way they treat their customers who buy on Amazon. But just in case, I called them. I explained to the lady who answered what was going on, and the noise it was (still) making. She opened a trouble ticket and said a warranty repairman would be calling me to come service it. The next day I got an email from Magic Chef with a buy-back offer. They said if I would cut off the cord and photograph the serial number and the cut cord and send them that, they would refund me on the dryer. I was so tired of messing with them over this dryer I said yes. I got the refund check today. They refund only the actual price of the dryer, not taxes or shipping. I am fine with that. I have since purchased a “portable dryer” here on Amazon which works great for just me. Have had this for a little over a month. 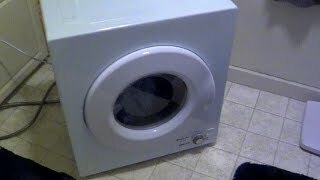 The drum and drying capacity is large despite its small external size, and the cool-down feature at the end of the drying cycle prevents the clothes from wrinkling if they have to sit in the dryer after it shuts off. The only thing I would tell buyers is that they should plan to mount it on a wall or place it on a waist-level or higher shelf: the controls are at the bottom of the unit (see pix) and I have to get down on my hands and knees to see them because I did not plan ahead and put it on the floor in an otherwise very convenient place (not a problem with the appliance, but it bears mentioning). I very much like this unit–even better than my last full-size dryer. Magic Chef Compact Electric Dryer - 1.5 Cu. 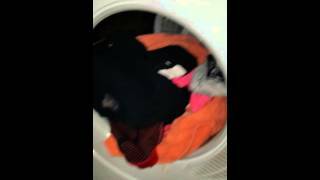 Ft.
Magic Chef Magchef Compact Electric Dryer - 3.5 Cu. Ft.